Dinner time again! I grew up eating a miriad of different casseroles…probably because we always had a houseful between all of us kids and then all of our friends lol. My Mom always made sure there was an awesome dinner on the table. Tonight I made cheesy chicken casserole, this one takes a few extra minutes to make but it’s So..worth it! This is a creamy delicious blend of ingredients, you’ll definitely be enjoying seconds! Here’s what you need! 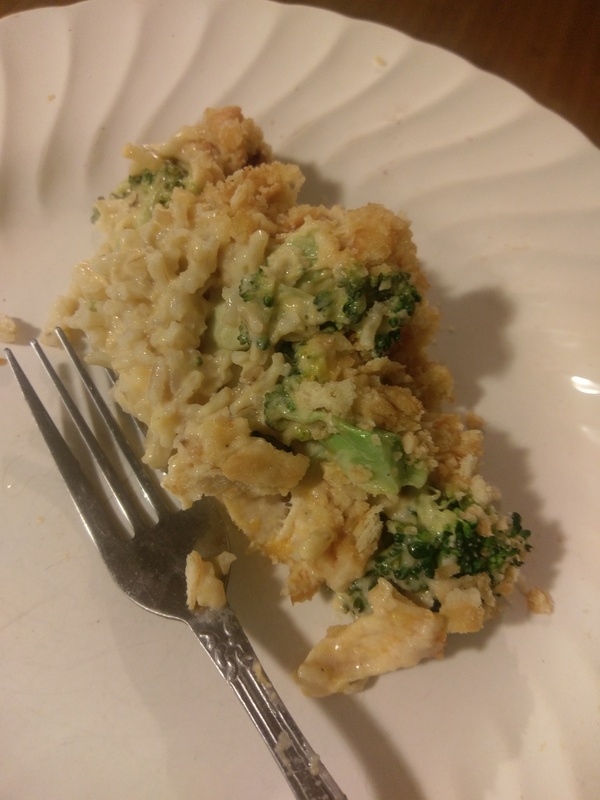 Layer rice chicken and broccoli in a 9×13 glass Baker. For the sauce add 1 c. heavy cream, 1/2c. Water, 1/2c sour cream, and two cups mild chedder cheese. Heat through until cheese melts and sauce is smooth. Pour over top of the rice, broccoli and chicken. For topping crush 3c of Ritz crackers, add 3Tbsp butter, mix until course crumbles are noted. Sprinkle over top of the casserole and bake for 15-20minutes or until topping is golden brown and crispy! Enjoy! !